Received a 3 in 1 lip tint few weeks back and I am really excited to show you how it works! To be honest, I am pretty skeptical on purchasing cosmetics online. 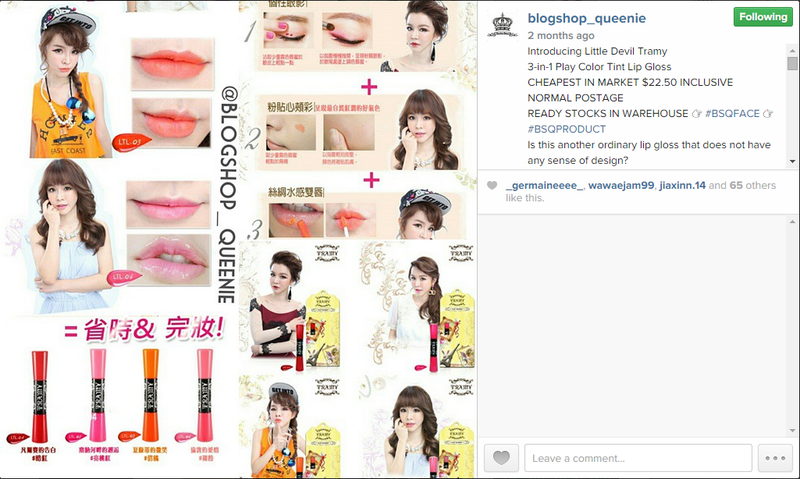 From what I know blogshop_queenie have been known for all their certified product and product effectiveness. Had a huge relieved after seeing many reviews about them! Honestly, I couldn't decide which shade to choose because I love the colour between coral and hot pink! This lipstick wasn't a brand I paid much attention to. But get to know how a 3 in 1 Lip tint works, it surely gives off lots of excitement to try this product. Since it's a 3 in 1 lip tint, how can I forget the steps for my cheeks? Besides using it on the lips and cheeks, this lip tint works on the eyelid too! I have to be honest that this part wasn't really up to my liking as an eyeshadow as I couldn't control the amount of the liquid and smudge them nicely on my eyelid, but it works really well for cheeks & lips! After all, I will still rate this product a 4.5/5 for its high pigmented colour stain and easy to carry it around since this lip tint is smaller than a pen size!